Due to obvious reasons, most users on Twitter end up blocking a lot of accounts over a long span of time. Blocking an account allows one to restrict specific users from viewing their tweets, following them, sending direct messages, tagging them and more. 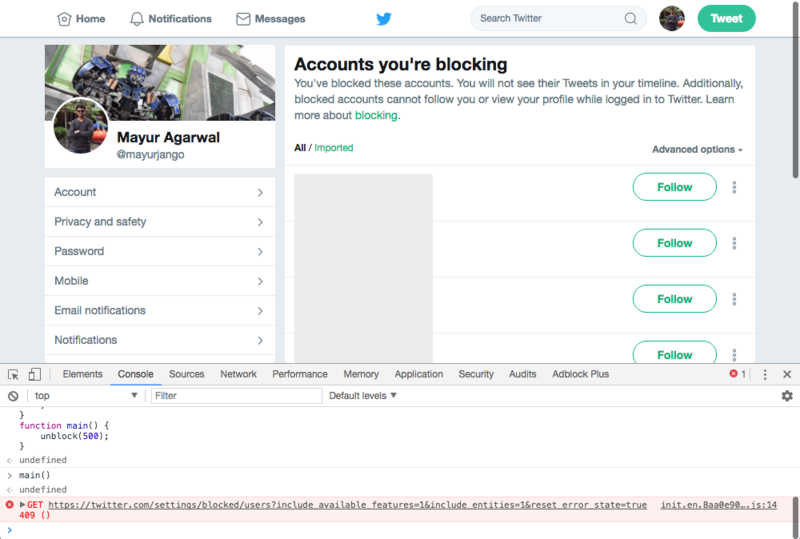 Though Twitter allows the users to easily block or unblock an account, there is no way to unblock all the blocked twitter accounts at once. In case you’re being generous and want to give a second chance to everyone on your blocked list, then it could be a tedious job to unblock each user account manually, especially when you’ve blocked hundreds of accounts. The unblock.js script performs each of those tasks by scrolling to the bottom of the page, waiting for it to load via a set timeout, and then continuing to scroll until it observes no difference in scroll height. Once the script can no longer scroll, it finds all of the unblock buttons, by searching for the 'blocked-text' class elements and clicking on each of them individually. 1. 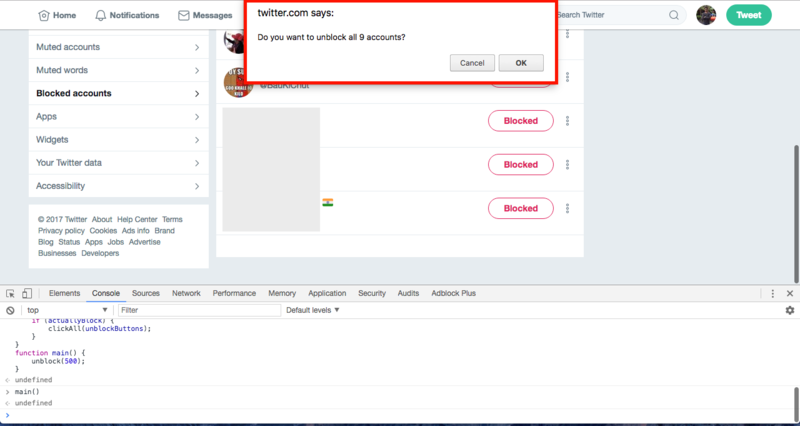 Visit Twitter Settings > Blocked accounts (twitter.com/settings/blocked) in Google Chrome browser. 3. Inside the console, paste the contents of unblock.js and press enter. 4. Now type main() and press enter. Let the process run, it may take a while depending on the number of blocked accounts. 5. A dialog box will pop-up. Simply click Ok to unblock all the accounts. The blocked button will change to follow. Blocked users will now be able to follow you and read your tweets. Refresh the page to verify that accounts have been unblocked. Note: DO NOT run the unblock script twice as you might end up following everyone you just unblocked. Is there a way to modify this to do ALL of my blocked accounts? It only does 18 at a time. I have 80,000 to do. It will do all that are shown on the screen. So keep scrolling down. In the script, where it says main(500) – change the number to 1000 or 1500. The script is waiting 500ms (half a second) before checking if it can scroll down some more. Twitter might still be loading the next scroll page and then the script will incorrectly assume it can\’t scroll anymore. By increasing this time to 1.5s (or more) it will likely scroll more and pick up more users to unblock.